It is always difficult to take a photo of soup dishes because one cannot get the photo of the soup and the ingredients immersed together. So far, I still haven’t figure out how to make a soup dish looks good on photo. Half a chicken, skin and fats removed – immersed in hot boiling water for a while to remove fats/yuckky stuff and until chicken turned whitish on the outside, wash with cold running water till water turns clear. Slow boil the chicken and vege for several hours. Preferably overnight in the slowcooker. Soak 50 gms of fish maw. Cut into bite sizes. Add into the soup and cook further. If you like, you can add a can of straw mushroom. The fish maw is cooked when it turned transparent. Do not over boil as some bad quality fish maw can even disintegrate into pulpy jelly! 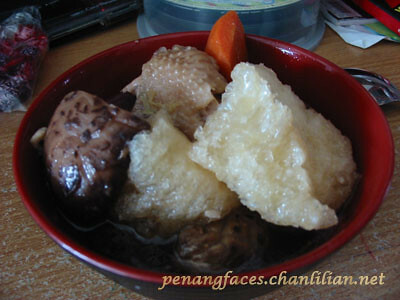 If you feel extra generous, you may add 2-3 dried scallops, 2 dried oysters and some kei chee (those red seedy things?) and the soup will taste more ‘expensive’. Add these at the beginning of cooking.